Read about our Starry Night Masquerade where we raised over $4 million for Puerto Rico Relief. RWJ Barnabas Health and CareOne – Collaborate on Quality of Care Initiatives. Click here to read the press release! 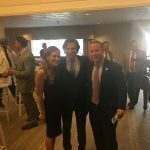 CareOne Honored as Corporation of The Year by Make-A-Wish® New Jersey at Annual Gala, Daniel Straus and Elizabeth Straus Honored as Humanitarians of The Year. Click here to read more. CareOne CEO Daniel Straus' vision of keeping seniors fit, comes to fruition with the Forever Fit program. Click here to learn more. CareOne Event Raises Unprecedented Funds for Make-A-Wish New Jersey. Click Here to Read More. Daniel E. Straus received the Spirit of Healing Award at Holy Name Medical Center’s 2016 Founders Ball. A fundraising campaign spearheaded by Daniel E. Straus has raised $1.3 million in support of long-time HealthBridge employee and cancer patient Dan Grimes. Under the strong leadership of Daniel E. Straus, CareOne’s Valentine’s Ball raised $1.1 million in support of The Valerie Fund and the thousands of New Jersey children with cancer and blood disorders for whom it provides care. Who is Daniel E. Straus? Daniel E. Straus is Chairman and CEO of Care One, LLC, a company that operates skilled nursing and assisted living facilities. He is Chairman of InnovaCare Health, a managed health plan with a strong presence in Southern California as well as Puerto Rico. In addition, Mr. Straus operates a family office that invests in hedge funds, private equity and real estate.